As per Analysis Mason, of the 413 commercial LTE networks that have been launched worldwide by the end of 2Q 2015, FD-LTE accounts for 348 (or 84%) of them, while TD-LTE accounts for only 55 (or 13%). Having said that, TD-LTE will be growing in market share, thanks to the unpaired spectrum that many operators secured during the auctions. This, combined with LTE-A Small Cells (as recently demoed by Nokia Networks) can help offload traffic from hotspots. China Mobile has managed to sign up more than 200 million subscribers in just 19 months, making it the fastest-growing operator in the world today. It has now deployed 900,000 basestations in more than 300 cities. From next year, it is also planning to upgrade to TDD+ which combines carrier aggregation and MIMO to deliver download speeds of up to 5 Gbit/s and a fivefold improvement in spectrum efficiency. TDD+ will be commercially available next year and while it is not an industry standard executives say several elements have been accepted by 3GPP. It should be mentioned that the target is to reach 300 million subscribers by end of 2015. SoftBank Japan has revealed plans to trial LTE-TDD Massive MIMO, a likely 5G technology as well as an important 4G enhancement, from the end of the year. Even though it was one of the world's first operators to go live with LTE-TDD, it has until now focused mainly on its LTE-FDD network. It has rolled out 70,000 FDD basestations, compared with 50,000 TDD units. But TDD is playing a sharply increasing role. The operator expects to add another 10,000 TDD basestations this year to deliver additional capacity to Japan's data-hungry consumers. By 2019 at least half of SoftBank's traffic to run over the TDD network. TD-LTE enables operators to reserve paired FD spectrum for mobile services, which mitigates against congestion in the spectrum from fixed–mobile substitution usage profiles. For people who may be interested in looking further into migrating from WiMAX to TD-LTE, may want to read this case study here. I have looked at the joint FDD-TDD CA earlier here. The following is from the 4G Americas whitepaper on Carrier Aggregation embedded here. Previously, CA has been possible only between FDD and FDD spectrum or between TDD and TDD spectrum. 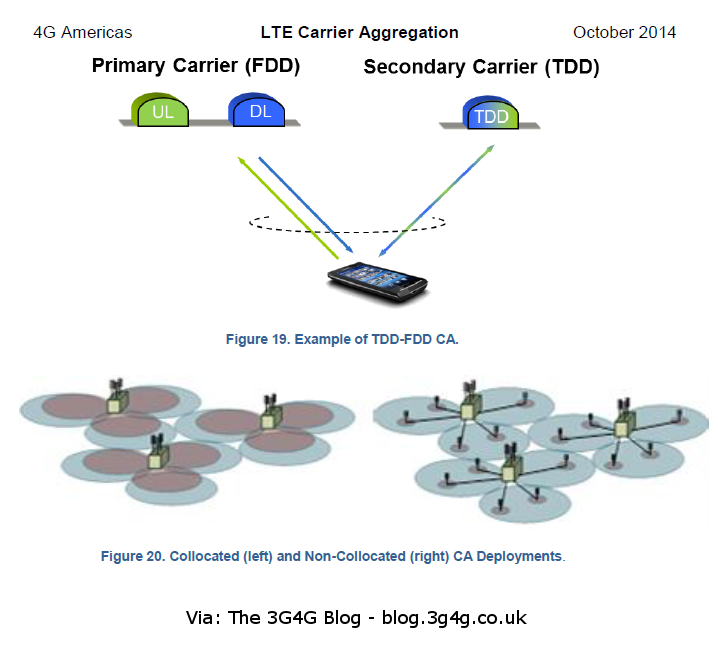 3GPP has finalized the work on TDD-FDD CA, which offers the possibility to aggregate FDD and TDD carriers jointly. The main target with introducing the support for TDD-FDD CA is to allow the network to boost the user throughput by aggregating both TDD and FDD toward the same UE. This will allow the network to boost the UE throughput independently from where the UE is in the cell (at least for DL CA). TDD and FDD CA would also allow dividing the load more quickly between the TDD and FDD frequencies. In short, TDD-FDD CA extends CA to be applicable also in cases where an operator has spectrum allocation in both TDD and FDD bands. The typical benefits of CA – more flexible and efficient utilization of spectrum resources – are also made available for a combination of TDD and FDD spectrum resources. The Rel-12 TDD-FDD CA design supports either a TDD or FDD cell as the primary cell. There are several different target scenarios in 3GPP for TDD-FDD CA, but there are two main scenarios that 3GPP aims to support. The first scenario assumes that the TDD-FDD CA is done from the same physical site that is typically a macro eNB. In the second scenario, the macro eNB provides either a TDD and FDD frequency, and the other frequency is provided from a Remote Radio Head (RRH) deployed at another physical location. The typical use case for the second scenario is that the macro eNB provides the FDD frequency and the TDD frequency from the RRH. Nokia Networks were the first in the world with TDD-FDD CA demo, back in Feb 2014. In fact they also have a nice video here. Surprisingly there wasnt much news since then. Recently Ericsson announced the first commercial implementation of FDD/TDD carrier aggregation (CA) on Vodafone’s network in Portugal. Vodafone’s current trial in its Portuguese network uses 15 MHz of band 3 (FDD 1800) and 20 MHz of band 38 (TDD 2600). Qualcomm’s Snapdragon 810 SoC was used for measurement and testing. 3 Hong Kong is another operator that has revealed its plans to launch FDD-TDD LTE-Advanced in early 2016 after demonstrating the technology on its live network. The operator used equipment supplied by Huawei to aggregate an FDD carrier in either of the 1800 MHz or 2.6 GHz bands with a TDD carrier in the 2.3 GHz band. 3 Hong Kong also used terminals equipped with Qualcomm's Snapdragon X12 LTE processor. 3 Hong Kong already offers FDD LTE-A using its 1800-MHz and 2.6-GHz spectrum, and is in the midst of deploying TD-LTE with a view to launching later this year. The company said it expects devices that can support hybrid FDD-TDD LTE-A to be available early next year "and 3 Hong Kong is expected to launch the respective network around that time." 3 Hong Kong also revealed it plans to commercially launch tri-carrier LTE-A in the second half of 2016, and is working to aggregate no fewer than five carriers by refarming its 900-MHz and 2.1-GHz spectrum. TDD-FDD CA is another tool in the network operators toolbox to help plan the network and make it better. Lets hope more operators take the opportunity to deploy one.